An existing Microsoft Excel file can be imported as an Excel workbook data source in PerformancePoint Services. Once the data source is created, an internal copy of the Excel file is used and all modifications to the data are done from the Edit tab in Dashboard Designer. 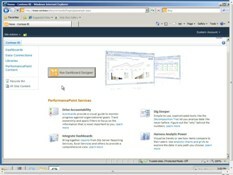 The original Excel file is disconnected and independent from PerformancePoint Services. In PerformancePoint Services, security settings for data sources are stored in each data source. However, when you create a data source to an Excel workbook, a copy is imported and stored within PerformancePoint and is no longer an external data source. In the Category pane of the Select a Data Source Template dialog box, click Tabular List and then click Import from Excel Workbook. Click OK. In the center pane, click Import. Microsoft Excel Web App workbooks that use the Click2Run method cannot be used as a data source in PerformancePoint Services. To view a demonstration of how to create an Excel Workbook data connection in PerformancePoint Services, watch the following video.